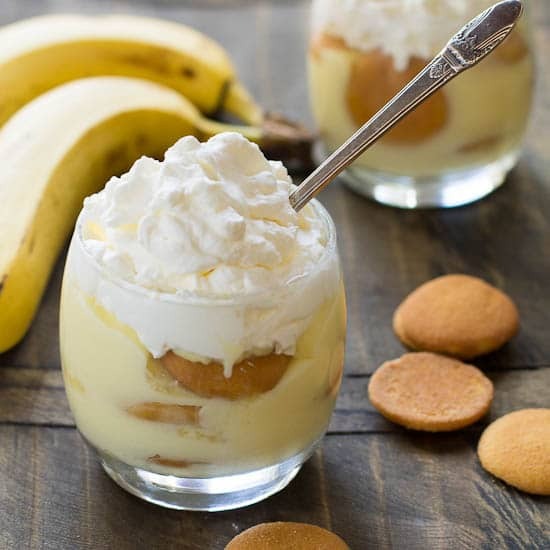 Banana Pudding, with layers of nilla wafer cookies, banana slices, and custard, is a classic southern dessert that kids and adults alike devour. 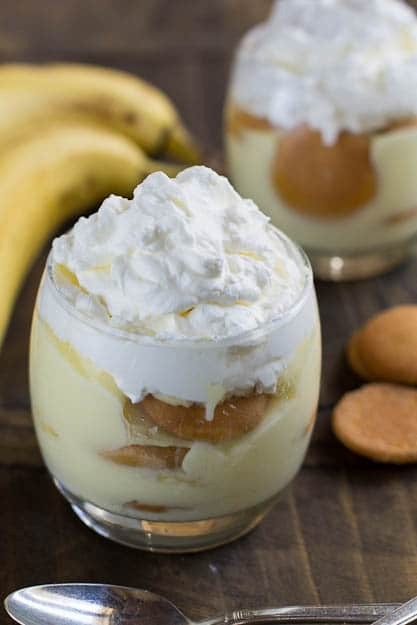 Banana Pudding, or Nanner Puddin as it is affectionately called, is one of the easiest desserts to make so long as you can make a homemade custard. If you can’t , just use a box of instant vanilla pudding. It won’t have that homemade taste, but it will still be good. A few weeks ago when I published Banana Pudding Pancakes, I realized Spicy Southern Kitchen was lacking a straight up Banana Pudding Recipe. I’ve posted Banana Pudding Cupcakes and Banana Pudding Bars, but no basic Banana Pudding recipe. Well, problem fixed. This recipe will satisfy all your banana pudding cravings. The best part of Banana Pudding is the Nilla Wafers. The way they get soft from the pudding is just so yummy. As a child, I’d just pick out the wafers and eat the whipped cream, completely eating around the bananas. But now I yum up every delicious bite and I love how the banana flavor permeates throughout the whole dessert. Even if you were to pick out all the banana slices before eating, it still tastes of bananas. Because the flavor of banana tends to be really strong in banana pudding, especially if made a day in advance, you don’t want to use really ripe bananas. The flavor will be too strong and the banana slices will develop an unappetizing brown color. I like to use bananas that are nice and yellow, but haven’t started to get brown speckles. 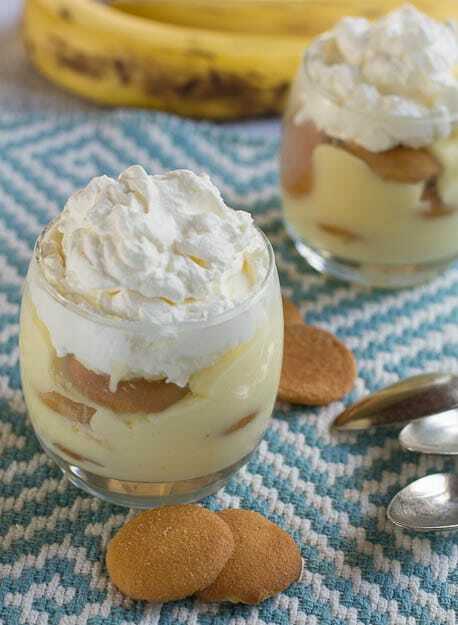 Since it is prepared ahead of time, Banana Pudding is a wonderful dessert to serve for picnics, barbecues, and potlucks. I love to serve it during the warmer months as a refreshing treat straight from the refrigerator. Note: You can use a tub of whipped topping to simplify things, but homemade whipped cream just tastes so much better. 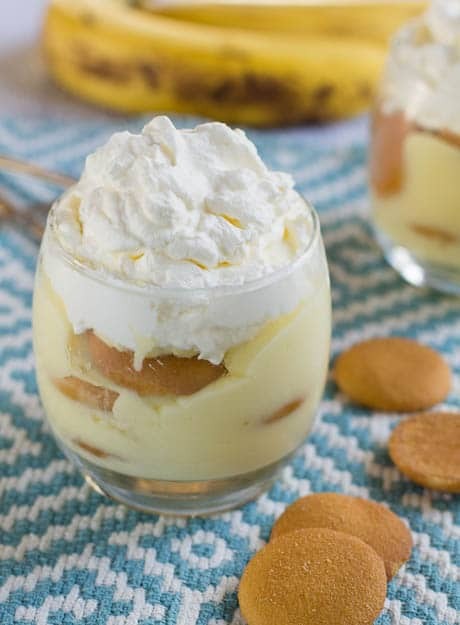 A classic southern dessert made of layers of vanilla wafers, banana slices, and custard and topped with whipped cream. Make the pudding. Place half-and-half, milk, 1/2 cup sugar, and salt in a medium saucepan with a heavy bottom.. Bring to a simmer over medium heat, stirring occasionally to help dissolve the sugar. Place egg yolks in a medium bowl and add remaining 1/4 cup sugar. Whisk together well. Whisk in cornstarch until combined well, about 30 seconds. When half-and -half mixture comes to a simmer, use a measuring cup to scoop out about 1 cup of the mixture. (Go ahead and turn the heat down some so it will not go beyond a slow simmer. Very gradually add it to egg mixture while whisking constantly to temper the eggs. Pour egg mixture into saucepan. Stir over medium heat for 2 to 3 minutes, until mixture is thickened. Remove from heat and stir in butter pieces and vanilla extract. If any of the egg curdles, pour the pudding through a fine-mesh strainer, pressing through with the back of a spoon. To assemble, cover the bottom of a 2-quart casserole dish with a thin layer of pudding mixture. Top with a layer of Nilla Wafers and then a layer of banana slices. Repeat layers, until all pudding is used. Spread whipped cream on top. Refrigerate for at least 4 hours before serving. You’ll also love this Banana Pudding Cake! This entry was posted in Desserts, Other Desserts and tagged Banana Pudding, bananas, southern desserts. Bookmark the permalink. Confused by recipe and something went terribly wrong! I never made this before, and followed directions and it came as like soup? Never thickened enough I guess? Followed directions exactly, but something went wrong? I simmered for almost 10 minutes and it never thickened. Question – why do you take out a cup of the milk mixture and don’t do anything with it? Makes no sense. I will try again, probably another recipe since this was total failure. Oh well, the next time will be better, it has to be. Always hoping for the best! Diane, you missed one of the steps! When you remove the cup of simmering milk mixture its so you can mix it gradually with the egg yolk and cornstarch mixture (this helps to keep the egg from cooking and turning lumpy). Once mixed, you incorporate that back into the original pot. Diane C…..you didnt read the whole recipe. You take 1 cup of the warm milk and add it slowly to the egg yolk, sugar, cornstarch mixture. It is called tempering the eggs. Tempering brings them closer to the temperature of the stuff in the pan, so you dont end up with scrambled egg soup. If you pour eggs into something hot, they will start to cook like poached eggs which will leave you with lumpy sauce instead of smooth custard/pudding. I have never made banana pudding before. The instructions don’t say what to do with the pudding. It said a layer of wafers then layer of bananas then repeat the layers. Does the pudding go on top of all the wafer bananas layers or does it get layered too? I have no idea. Why vague about what to do with pudding? Yes. Just layer cookies, bananas and pudding. You can also make your own rules in your kitchen – and do it differently. The classic recipe is on the Nilla Wafers box. I have even used cool whip as an additional layer on top of the pudding layer to make it a little “lighter” in the heat of summer. (nanners, cookies, pudding, cool whip, then another layer, and another (until you run out of ingredients or your container is full). First time making Banana Pudding. Very good, top shelf! So easy to make. Just like making a pie minus the crust. Can’t wait for the cooling process to hurry! great recipe but I used Ginger Snap Cookies instead. I couldn’t figure out what you meant by Spicy Banana Pudding other than the Vanilla Wafers so the Ginger Snaps gave it more of a Bite and it was great! I took one of the Cookies and grinded it up and sprinkled on top of the Whip Cream. I just made this recipe. I used light brown sugar instead, not sure why. I’ve never made banana pudding or any sort of pudding before. I was nervous about the possibility of the eggs curdling, but the directions were clear to follow and it worked out fine. Thanks for sharing this recipe, it was really good! I agree that this banana pudding looks delicious and because it’s homemade makes it even better. Would it be just as good if I made a meringue out of the egg whites? This looks fantastic Christin! I love banana pudding and yours looks so creamy and tasty! Fantastic tip on using yellow bananas!! I’ve been CRAVING homemade banana pudding, and this post and these pictures have done the trick! Thank you!! Thanks for stopping by Deittra! Hope you are having a wonderful week! Good golly WOW – I so love banana pudding and yours looks and sounds exceptional! Real home made pudding with bananas.. sounds very delicious! Lol! I used to eat around the bananas too! I always thought they were slimy! 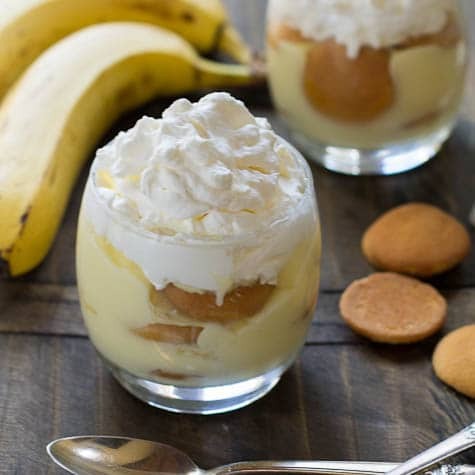 This banana pudding looks fabulous! I’m sure I would lick the bowl clean! Oh this banana pudding looks so good! This looks delicious- I would love a bowlful right now! Banana pudding is one of my favorite classic desserts! Everything about it is perfect! Looks fabulous Christin! I love banana pudding, but have never made homemade. I absolutely love banana pudding but I have never made it from scratch! This looks amazing!! Yum, banana pudding! Looks totally creamy and delicious ! Thanks Jessica! Hope you have a great weekend! creamy richness that will me also the Belle of the Potluck crowd.